Kevin MacMillan: What does the future hold for Tahoe-Truckee? From Truckee to Olympic Valley to Tahoe City to Incline Village, and every community in between, there no doubt are differences, from political views to demographics and beyond. Heck, just driving from Incline to Truckee, you can almost feel the air shifting from conservative red to liberal blue. But one thing I’ve noticed the entire region shares in common is, for the most part, a dichotomy among residents about how we should define ourselves. Are we a tight-knit community where the locals reign supreme? Or are we a resort community that should cater more to visitors? Or perhaps somewhere in between? Depending on who I talk to, the answers are fascinating, so let’s look at the two ends of the spectrum. On one end you have the longtime locals composed mainly of the “boomer” generation. They’ve lived here for years, they vividly remember what it was like before big development came into town, they were here when the TRPA was as corrupt as government comes, and many employ a fierce “not in my backyard” mindset. They very much do not agree with the mindset of some that we need to maximize tourism revenue in order to maintain a sustainable economy. And because of this, it’s why there is such loud and staunch opposition to development and renovation projects like the Martis Valley West exchange with East West Partners at Brockway Summit; the potentially trend-setting Squaw Valley village transformation; or the Diamond Peak master plan that would open the door for summer operations. On the other end, you have the younger crowd, which can include middle-age families, 30- and 40-something business owners, and many in the 9-to-5 working class, i.e. teachers, medical professionals, government employees, etc. This crowd is looking to keep families living here full time, and in turn, often will get behind larger projects that promote tourism because they believe the region’s problem of a diminishing population will only get worse if we maintain the pre-Great Recession status quo. 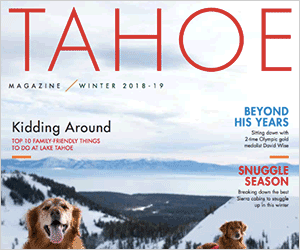 With fewer and fewer full-time residents staying, and the growth in recent years of second- and third-home owners, fears of Tahoe becoming a ghost town do exist. Obviously, not everyone falls into these categories, and clearly lines can be crossed here, but I’ve heard opinions and arguments from several people who easily can fill either side. According to the U.S. Census and other demographic studies, population at the lake has declined significantly since 2000 (Truckee’s population, meanwhile, increased by some 2,300 people from 2000 to 2010, mainly in the Latino sector). This all is coupled with an increase in tourism during holiday and busy summer weekends over the past few years. Just look at the Fourth of July crowds last month for proof. So what are we? My opinion is the voices that continue to be the loudest are held by those in that first end of the spectrum I point to. They’re the ones at meetings vehemently opposing ideas that they feel will ruin their community. But I do not find it realistic to keep things the way they are and/or the way they once were. We need to create programs and promote responsible —keyword “RESPONSIBLE” — redevelopment to attract people to spend their money here. Our economy must thrive on tourism. Our local businesses rely on it to stay afloat, and a good deal of our working class wouldn’t exist without it. Simply put — living in the past is the wrong approach to improving our future.